HomeUncategorized Event Recap: Who Benefits from California’s Economic Boom? Who Benefits from California’s Economic Boom? 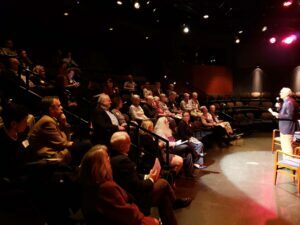 We were honored to host Lenny Mendonca and Margaret Hanlon-Gradie on March 13 at Lesher Center for the Arts in Walnut Creek. We hope that all who attended were as inspired as we were by the thought-provoking conversation on both the statewide and local economies. Lenny shared the sobering reality that “the California dream is now a coin flip;” that there is only a 50/50 chance that an individual’s economic future will be better than their parents. Both Lenny and Margaret offered hopeful ideas for how to move from our current state of widening economic inequality to a “California for all.” At the local level, Margaret called for us to “think of ourselves as one county, not four separate regions. We have way too many people struggling. We have to own the whole and use collaborative models.” She also stressed the need to “define high-quality jobs in policy language” that includes livable wages and family-sustaining benefits. As part of his remarks, Lenny went on to say, “Community foundations are critical partners to catalyze the voice of those who are not being heard in policy change.” We at East Bay Community Foundation could not agree more. We are addressing economic inequality in our region through our Inclusive Economy Initiative. If you are interested in learning more about EBCF’s work on Inclusive Economy, please contact Sabrina Wu at swu@eastbaycf.org.